Bag O' Barley 100% certified barley straw that is fish safe - plant safe - pond safe. Constantly active while decomposing. Multiple sizes to accommodate ponds large and small. Bales are loosely packed for the best flow of water possible. Treats 1000gal per 8oz bale. Barley Straw Pellets 100% natural and organic ingredients. Improves water quality and fish and plant health. Disperses quickly. Formula includes natural peats and humates. Buffers pH and works year ‘round. A 4.4 pound bag treats 500 gallons for up to 12 months. Clear Water Barley Straw Bales Clear-Water Barley Straw Bales. Mesh bag and cork float included. Treats for up to 6-months. Microbe-Lift Barley Extract Microbelift offers a Liquid Barley Extract that is super easy to use. Simply pour liquid into pond and walk away! Liquid Barley goes to work on contact! Microbe-Lift Barley Pellets Barley Straw pellets work faster, have less mess, and are easier to apply than bales, pillows or pads. Easy Pro Barley Straw Extract This fermentation extract contains a blend of acids, enzymes, beneficial pond bacteria and fungi, which help to keep your pond water clean and clear. The Barley Bundle - 8 oz The better bundle! 8 oz Certified organic barley straw…no chemical fertilizers, pesticides, or herbicides used. 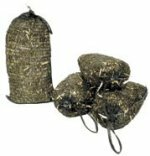 Sturdy mesh bags that fish can not tear. 100% natural; safe for all pond life. SAVE ON QUANTITY PURCHASE!